With Advent season coming up, I've been searching for a good Advent devotional. To be honest, I have never owned one, and thought it was about time that I did. I recently came across A. W. Tozer’s From Heaven and thought it might be fit for what I was looking for. From Heaven, while not bad, wasn't what I had originally thought it would be. When I think of an Advent devotional, I expect a series of devotions that lead up to the Christmas holiday and celebration of Jesus' birth. I felt it was a bit disconnected as a themed devotional, with the exception of the fact that each day begins with a scripture verse to mediate on. Having said that, I do like the way the book is set up. It has four sections to highlight each week of the Advent. Those four sections include seven chapters, one for each day of the week. This is essentially a collection of reflections from Tozer during his days as a pastor and teacher. The written works in the book are still related to the birth of Christ and some are actually quite lovely to read–even poetic in nature. I did find that I sometimes had to go back and reread parts of the devotional just to get a full grasp on the message he was trying to convey, because his words run deep. 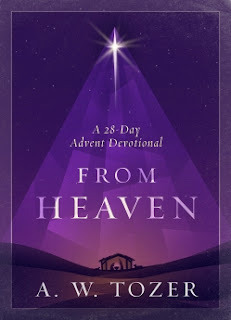 Although I found the writings in From Heaven quite profound, I wouldn't necessarily recommend it as simple daily Advent devotional that builds up to Christmas day. I was a little disappointed, because that is what I initially thought it was. Nonetheless, it is still well worth a read during the Christmas season, especially if you are looking to see the Advent from a more scholarly approach.